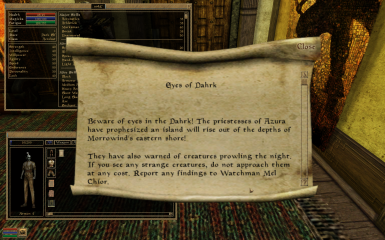 Tribute Books is a small quest and item mod in which the player can receive four free books and be able to buy eight more new ones. These books range from funny to strange, short to long, note to play, and are all originals made as tributes for various modders in the community and a few outliers. Needless to say, this is only the first set out of hopefully many tributes. Now, let's get started: What is included here? Well, as of the 1.1.0 update, there's now 10 books, 4 available for free as a reward for the quest, 4 available in stores, and two available in one location each. 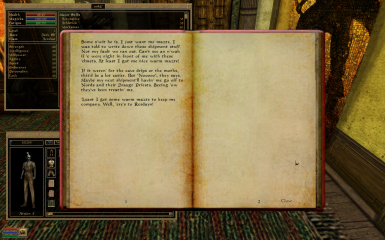 There is also a small unmarked quest regarding the two books, which you'll get a few hints for during your play. Also, most books have been added to, or had some of the text changed and/or corrected. It also fixes a small issue in the results box for dialogue during the quest that would not update the quest to allow completion. This has been addressed, and rewards have been rebalanced. All books are originals, and most are tributes to individuals in the community. There are a couple wacky ones as well, but they're not really the focus. All text is free to use, but please provide credit if you wish to publish. Enjoy the quest, and the reading!